My late Uncle lived in San Diego most of his life following his term in the War and it was one of my favourite places to visit. On occasion we would road trip into Tijuana for tacos and the experience. I say experience because back in the 70’s and 80’s that is exactly what it was. It wasn’t unusual to see a the box of a pick up truck piled high with raw meat while driving down the street. I kid you not. It was also in Tijuana I had my first real authentic taco. Sure I’d had them in San Diego but it wasn’t the same. In Tijuana they were dirt cheap, the real deal, and my Uncle had me believing the pork tacos we were eating was shredded donkey meat. Back then who really knew. Spending time at the Caliente Racetrack in Tijuana was one of my Uncle’s favourite things to do (they never had kids) so his knowledge of good cheap eats in Tijuana was solid. My memories of time spent there on day trips makes me think of a trip to Cuba in 2003. Similar somehow. Even though it’s been a very long time, Tijuana still fascinates me. Since it’s a strong part of my early memories, it probably always will. Learn more about how Tijuana has evolved in this story by the LA Times here. One of our goals here at Bakersbeans this year is to do more meals that are “cook once, make it last into 2 – 4 meals”. I’ve never been one to love leftovers, unless it’s cheese, so being able to turn a roast or something big into fresh new meals daily is something I’ve only dabbled in occasionally. I’ve been meal planning since the kids were babes so this part is not challenging, making something new and exciting each time with leftovers will be the challenge. 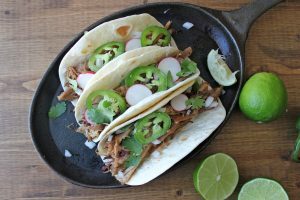 They are pork tacos. A dish from Mexico consisting of braised or simmered pork until tender. 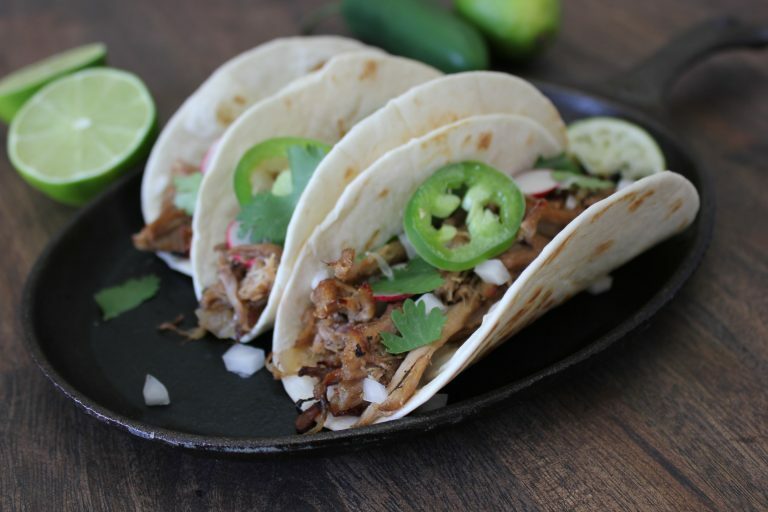 Authentic tacos are made with braised or slow cooked meat. 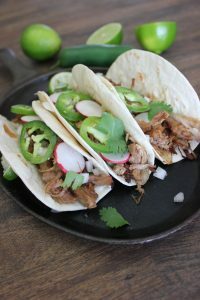 When making this Slow Cooker Beer Pulled Pork the other day it made sense for me to keep the flavours simple so I could enhance them if needed when I used the pork in other dishes. 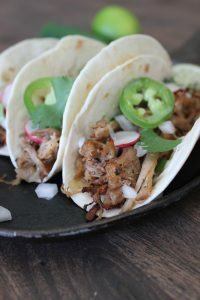 My inspiration for these pork carnitas comes from those trips to Tijuana with my Uncle. He hasn’t been with us for a while now but some of my fondest memories are my trips to San Diego. In fact it’s time I bring my own family there to see what I love it so much.